Much has been made of the deterioration of the black family. 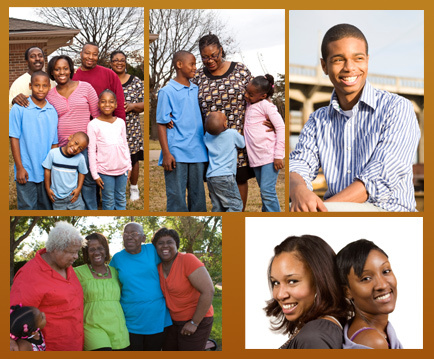 On this Sunday, we salute the black family in its myriad forms, from single-family households to extended families. We speak affirmations of faith over these households, that each family head will have the boldness like Joshua to proclaim, “As for me and my house, we will serve the Lord!” (Joshua 24:15). Reader: Because of the Lord’s blessings, each of us has been given a family. care for us, and for whom we care. Reader: The family unit must be strengthened. People: Under the hand of God, we strive to teach our children the ways of godly living. By the grace of God, we commit ourselves to building and sustaining loving and affirming familial relationships. Reader: We’re grateful to God for blessing us with many types of families in the household of faith. Together, we strengthen each other. All: And as for our houses, we will serve the Lord! (c) Hold to God’s Unchanging Hand. By Jennie Wilson. Tune, (UNCHANGING HAND), by F.
(c) Done Made My Vow. By Nolan Williams, Jr.
Morton, Paul and the Full Gospel Baptist Church Fellowship. Embracing the Next Dimension. Nashville, TN: Light, 2007. Various Artists. Performed by Judith Christie McAllister. Essence of Praise and Worship: Live. Nashville, TN: Alliant, 2005. RaSean, Todd. Urban Worship. Utopia Music Group, 2006. New Direction. Rain. Inglewood, CA: Gospocentric, 2004. Morton, Bishop Paul and the Full Gospel Baptist Church Fellowship. Embracing the Next Dimension. Nashville, TN: Light, 2007. Clark-Cole, Dorinda. Dorinda Clark-Cole. Inglewood, CA: Gospocentric, 2002. Jones, Noel & the City of Refuge Sanctuary Choir. Welcome to the City. Indianapolis, IN: Tyscot, 2007. County Gospel: Featuring Various Artists. Los Angeles, CA: Hollywood Records, 1987/1994. Pastor Rudy Rasmus: Touch The Pastor Rudy Experience, Vol. 1. Houston, TX and New York, NY: Music World Entertainment/Spirit Rising Music, 2006. The Bill Gaither Trio, Vol. 2. The Family of God. Alexandria, IN: Gaither Music, 2005. Davidson, Kevin & The Voices. Overflow. Nashville, TN: New Haven, 2006. Perfection. Perfection. Seattle, WA: JEA/Right Now, 2008. Jason Nelson and Jaelyn. Place of Worship. Nashville, TN: Central South Distribution, 2008. IIIrd Tyme Out. Living on the Other Side. Burlington, MA: Rounder Records, 1996. Live. Nashville, TN: CMG, 2009. Jamel Strong Presents The Triple M Mass Choir. It’s Your Time. Huntsville, AL: Strongtower (INDIE) , 2004. Arkansas Gospel Mass Choir. Hold on for Life. Middleburg, FL: T Records, 2008. Toney, William & Teleios. Any Way You Bless Me. Nashville, TN: Alliant, 2005. Smith, L. Spenser & Testament. Statement. Middleburg, FL: Emtro Gospel, 2006.